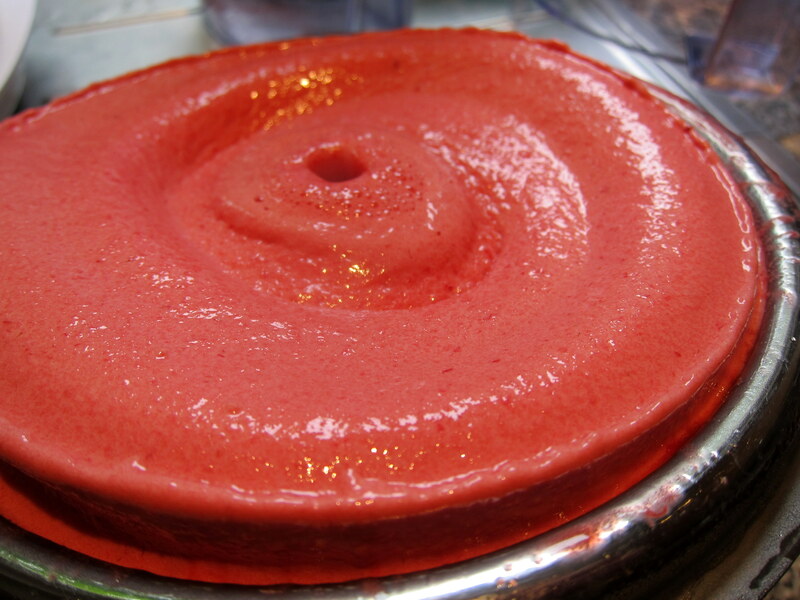 Raspberry sorbet – even when prepared in the easy, “standard sorbet way” – usually turns out very nicely. But this time, we will go that extra mile and add a further delicious dimension – with the help of classic soft Italian meringue. Read on! 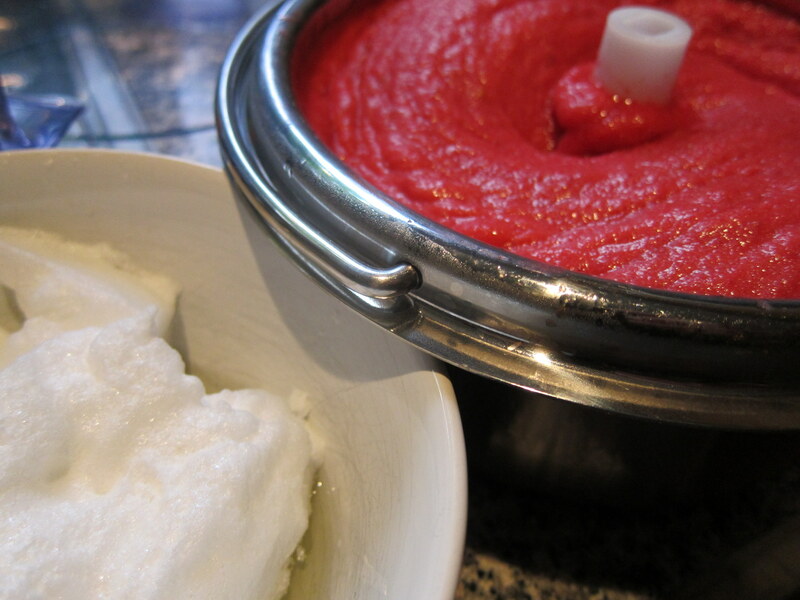 The Old school-way of making superb sorbet – combine your sorbet with some Italian meringue! While slightly more laboursome than just whisking together a typical sorbet, you will find that the result really speaks for itself. The soft Italian meringue is not used as an add-in (such as the crisp meringues used in other recipes). Instead, it becomes an integral part of the sorbet, generally improving the consistency and, arguably, the flavour-depth. And unlike the often-seen suggestion to whisk in raw egg whites in sorbets, properly prepared Italian meringue should also be “health safe”. UPDATE: For an egg-free alternative to Italian meringue – make aquafaba meringue: it’s actually easier, and provides the same advantages! 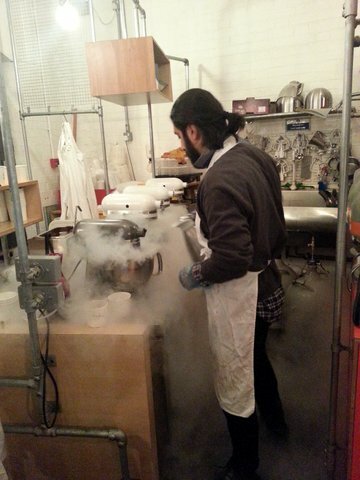 Simple sugar syrup (= a mix of sugar and water) is a standard core ingredient when making sorbets. But since the Italian meringue contains quite a lot of sugar, the basic sorbet-recipe needs to be adjusted accordingly: otherwise, the end-result would likely end up being sickeningly sweet. The base recipe I normally would use for sorbets typically contains 500 ml of simple sugar syrup (=made up of equal parts of water and sugar). For this recipe, however, I would suggest that you start out with a simple sugar syrup made up of 2 parts water and 1 part sugar. For 500 ml sugar syrup, this would mean about 170 ml (0.7 cup) sugar and the rest water. This will work out nicely in the end anyway, since the Italian meringue will add about 40 ml (0.16 cup) of sugar in itself. 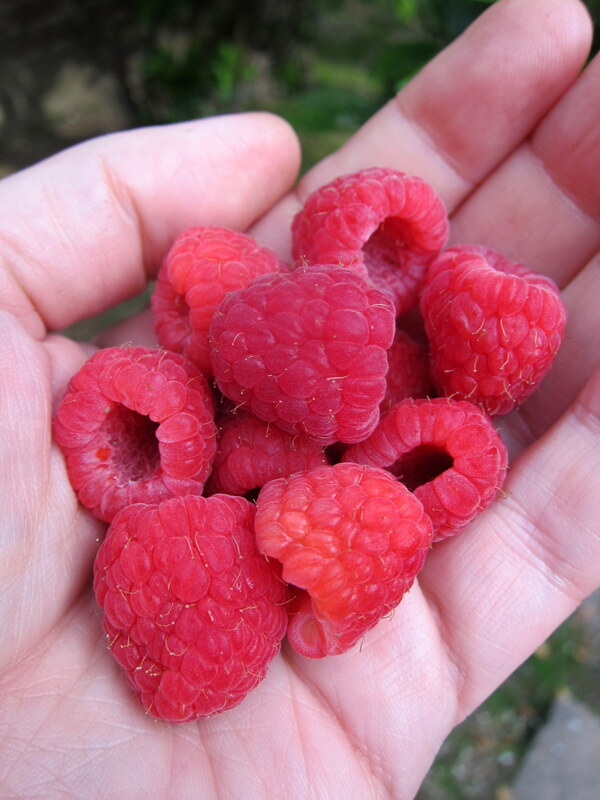 I find berries easy to love, and raspberries particularly lovable. They already figure in a few recipes on this site (check out my favourite raspberry frozen yoghurt, for example). For this recipe, both fresh and frozen berries will do fine. And all you actually have to do is to purée them (using a handheld mixer typically does the trick for me), and add the lemon juice. Following the standard sorbet recipe, I would recommend an amount of berries equal to the amount of sugar syrup: in this case, about 500 ml (2 cups). Heavenly raspberries … who can resist them? Personally, I like to feel the raspberry seeds when enjoying my sorbet. In case you happen to be one of those who hate any hint of solid texture in your sorbet, however, feel free to run the purée through a sieve – that way, you will end up with a perfectly smooth sorbet. As you may remember, my chef friend Peter Englund taught me how to prepare Italian meringue. All the detailed instructions (including all the good things to be said about this truly classic sorbet-ingredient) are in this post: go there for the exact recipe! In super-short summary, begin by making (yet another) sugar syrup [note, however, that the proportions of sugar and water now should be roughly 2 sugar to 1 water!]. This time, the sugar syrup should also be boiling hot! Then, preferably using a kitchen assistant, whisk together the egg whites and the sugar. Once foamy and soft [think softly whipped cream], begin to – while whisking continuously – drizzle in the hot sugar syrup. Continue whisking until the meringue has reached a half-baked, firmer stage [think firmly whipped cream]. This process should take about 10-15 minutes or so. If you follow my instructions, you would only use about 1/4 of the Italian meringue to be prepared. So, why make more than needed? Mainly because it can be rather difficult to make smaller quantities, practically speaking. But making more than strictly necessary will also save you quite a lot of time and efforts when it is time to make your next sorbet: the prepared meringue stores wonderfully in the freezer, making the preparation of the next few batches of sorbet a breeze. Yes, that’s it. You are almost done now. The meringue should be well blended into the sorbet, after which you may continue churning a few more minutes in the ice cream machine. But at this stage, you could also simply pour the sorbet into a freezer-safe container, cover with plastic film and a lid and put it straight into the freezer. Again, be mindful about how much meringue you add – for a standard batch of sorbet, count with the meringue-equivalent of (roughly) 1 egg white. If you overdose, you will end up with a sorbet-variety called spoom. But unlike spooms, the main idea here is that the meringue never should change the basic flavour- and consistency character of the sorbet – only enhance the good qualities and making them better, not different. Ready for the freezer (or immediate consumption). Notice the increase in volume, and also how the original colour from above has paled. 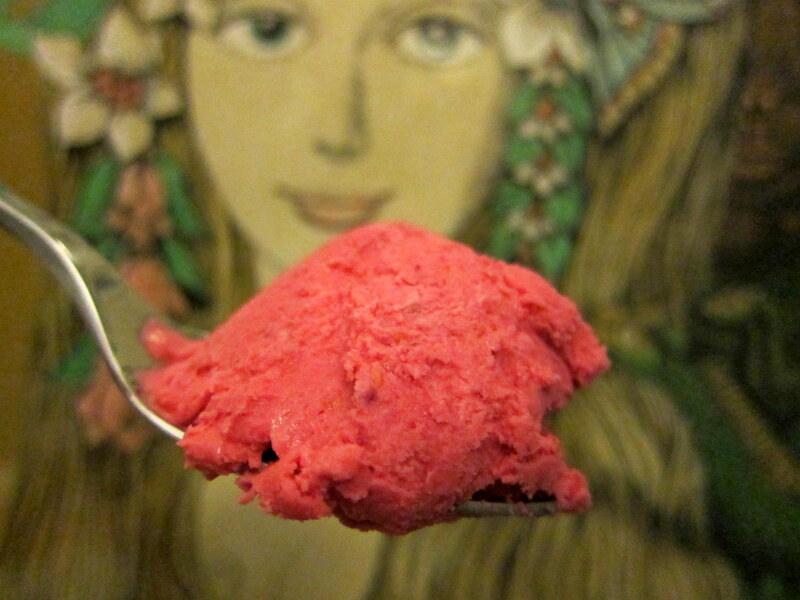 This Old school Raspberry sorbet really stands out in comparison to typical “standard” sorbets. The pure fruit flavour is there, and even seems to have received a boost in terms of flavour depth. And both the consistency and structure are impeccable! Food-technically speaking, the meringue acts as a stabiliser and ensures that enough of the important air is maintained within the sorbet. Even prolonged storage in the freezer did not bring about any particular deterioration, and the sorbet remained perfectly scoopable all along. These days, my friend Peter the chef tells me, most chefs no longer bother with making Italian meringue for sorbets – instead, they often just add some whisked-up raw egg white. But while it may seem a bit tedious to prepare the Italian meringue, I strongly hope that all real lovers of sorbets and ice creams at least once get the chance to experience the greatness of sorbets prepared this classic way. I even have some friends who claimed to ‘not really like sorbets’ but changed their minds after having tasted this recipe! Honouring the traditions of skilled pastry chefs and ice cream makers, this Old school sorbet comes with all the superior qualities brought about by the inclusion of the soft, 'half-baked' Italian meringue! To make up for the added sugar, the sugar of the sorbet base recipe has been reduced accordingly. Purée the raspberries and add the lemon juice. Prepare the simple sugar syrup [here with a reduced amount of sugar, in order to adjust for the sugar to be added through the Italian meringue]. Mix the raspberry purée with the sugar syrup for the sorbet and churn in your ice cream machine according to instructions. 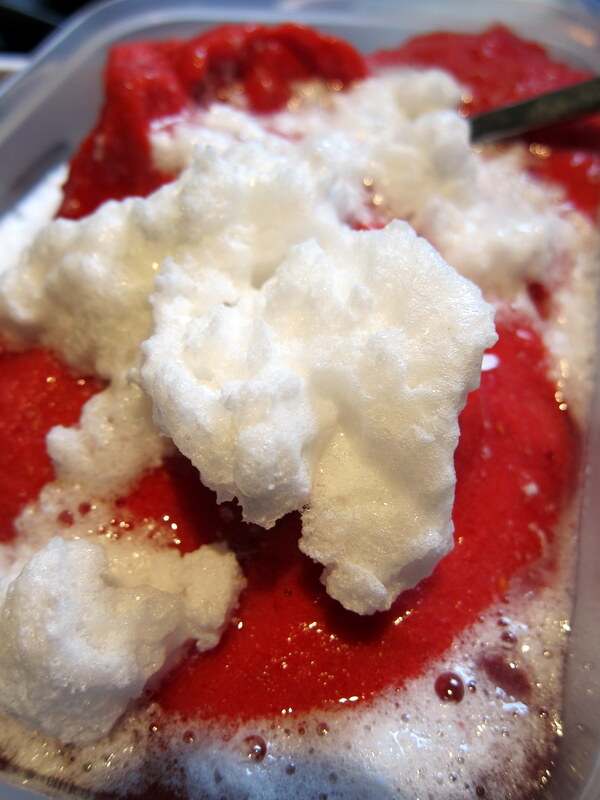 When the sorbet is almost ready, add about 150-200 ml (about 0.6-0.8 cup) of the Italian meringue. Whisk well and continue to churn a little in your ice cream machine, or transfer the sorbet to a freezer-safe container straight away, cover it with plastic film and a lid and put it in the freezer. If I understand it right, the egg test would not work if I plan to add the meringue at the end since the batch needs to contain less sugar. Secondly, this particular recipe states to use 75 ml less sugar in the base because the meringue will cover the rest. However, reading the recipe for the meringue, it contains 150 ml sugar and if divided by 4 would be about 37 ml. So I should only use 37 ml less and not 75 ml. Please correct me if I understood it wrong. Since the aim here is to prepare a simple sugar syrup which is less sugary than normal to start with, the egg test could possibly be helpful by showing whether the egg stays under the surface (i e syrup not being “sorbet sweet”). But you are right about the measures – the text in the body of the post was misleading and has now been corrected (Thanks for spotting this!). Thus, and according to the recipe in the Italian meringue post, you should reduce the sugar for the simple syrup with about 40 ml. Hi! This is the website I go back to again and again. Can’t thank you enough for all the ice cream my family is eating :-)My question is could I use this same method for lemon sorbet? and if yes, what would be the solids in the recipe? Could I sue the lemon pulp? and what about measurements? And yes, you could certainly use the same method for, basically, any sorbet: the main thing to keep in mind when applying the method to other sorbet recipes basically relates to the amount of sugar: as the Italian meringue also contain sugar, you would typically need to reduce the amount of sugar normally used for the sorbet itself accordingly. There won’t be much solids (which is as it should be with genuine lemon sorbet) but the Italian meringue will greatly boost the consistency anyway. To give you some ideas about measurements, I would suggest that you check out these recipes for lemon sorbet and lime sorbet. Best of luck! 1) Generally speaking, how long does it take to make “Italian meringue”? 2) Is it REALLY true that an “Italian meringue” based sorbet will remain scoopable in freezer??? I find this hard to believe. What if the freezer is set to 0 degree??? On plastic film: Well, necessary and necessary … the sorbet (and ice cream in general) will last better with plastic film: obviously, if you intend to enjoy your sorbet the very same day you prepared it or so, it won’t really be necessary. But if you plan on keeping it in the freezer for a couple of days or so, you are likely to appreciate the difference. On Italian meringue (1): Counting in some time for preparations, cooling down and all, a likely time to make Italian meringue could perhaps be estimated to about 30 minutes. But then again, this is likely to be affected by the experience of the maker: when I first made it, the time it took to go through the necessary steps in a correct way felt like an eternity (although, in reality, it probably was more like 40-45 minutes or so) 😉 . But once you get the hang of it (which well may happen after you have done it once), it tends to be so much easier the next time. Is it necessary to cover with plastic film before putting in freezer??? Please explain why or why not. I made this today with a combination of fresh strawberries and peaches and it is out of this world delicious. Thanks for the super recipe! I am playing with paw paw sorbet, I found your delightful website looking for ways to incorporate bourbon in the sorbet along with fruit, meringue mix. Paw paws are very seasonal, very and in short supply. My first batch was made with simple syrup, lemon and mint. Results okay but not wow! Sorry, no question, how much bourbon, a percentage?? 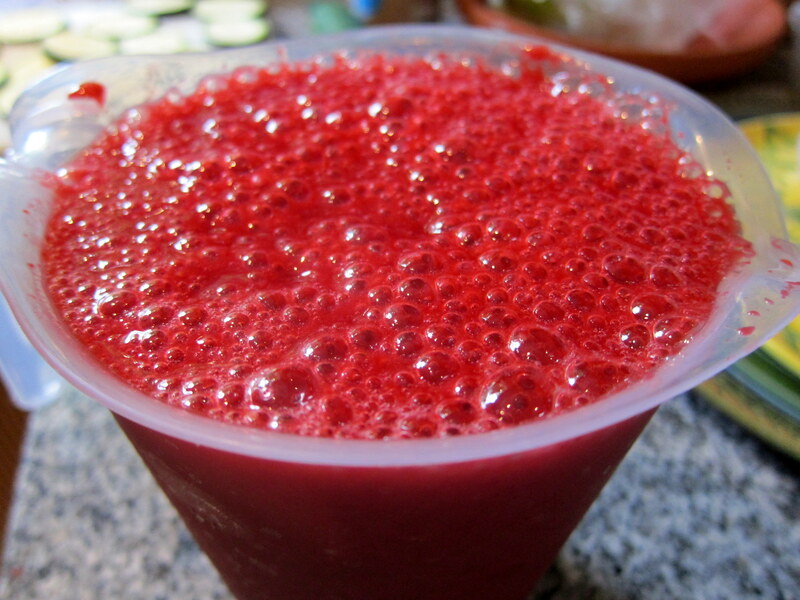 As a general rule of thumb, it is usually better to err on the side of caution when it comes to alcohol in sorbets (particularly when it comes to bourbon and other hard liquors): adding too much can easily turn your sorbet into something resembling Slush puppy, never ever freezing properly. I would suggest starting out with no more than, suggestively, 1-2 tablespoons of bourbon and see if that will do the trick for you! 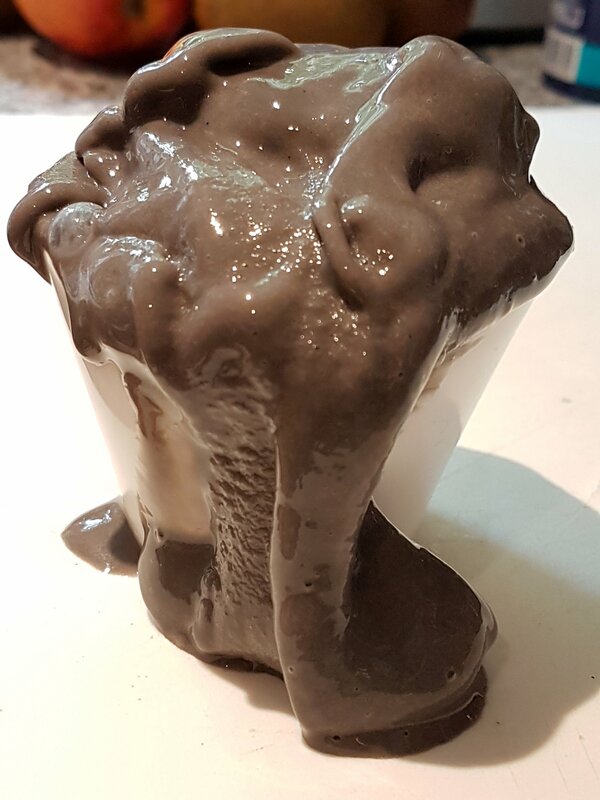 Your sorbet recipe turned out great. I now have 3 portions of italian meringue in my freezer. Before I add them to my next sorbet, do I need to re-whip them? Or just de-frost and add? Glad to hear it worked out so well for you! Next time, you only need to defrost the meringue a little and add it to the churning sorbet (no need to do any re-whipping). Hi! I would love to try out this technique, but is it possible to use when producing large, multi-gallon batches of sorbet? 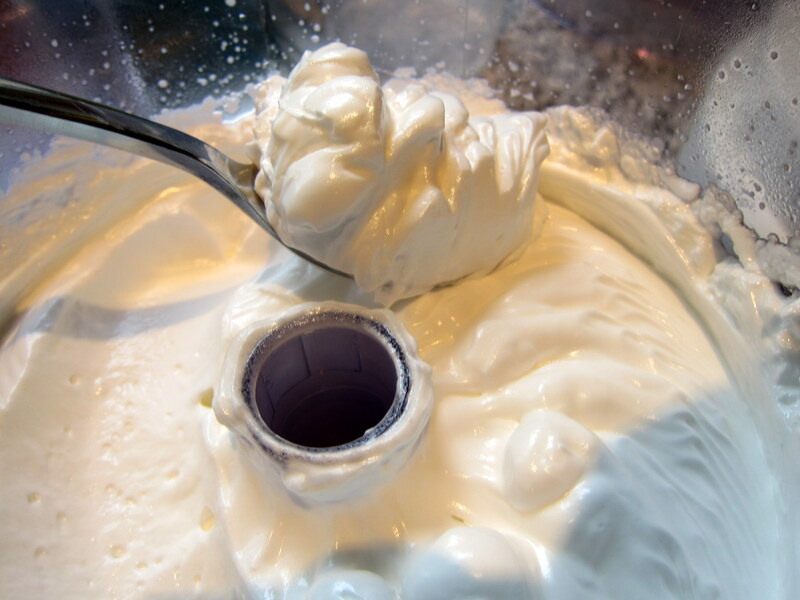 I’m having a hard time imagining how I would be able to take all of the base out, blend the meringue in, and then continue churning it with such a large amount. Any advice? Thank you! Best recipe ever my husband who is italian loved it. i made 2 different gelato recipes but this one with the meringue is the best. Do you have a book I could buy?